We have to pay fees when investing, that’s unavoidable. But how much we pay is important as it impacts out long-term returns and knowing what they really are all about is equally important. Over the last two decades the war against fees has been a huge success. Back in the late 90’s paying over 5% a year was a regular occurrence whereas we now have local Exchange Traded Funds (ETFs) starting as cheap as 0.1% and the saving to investors is massive. 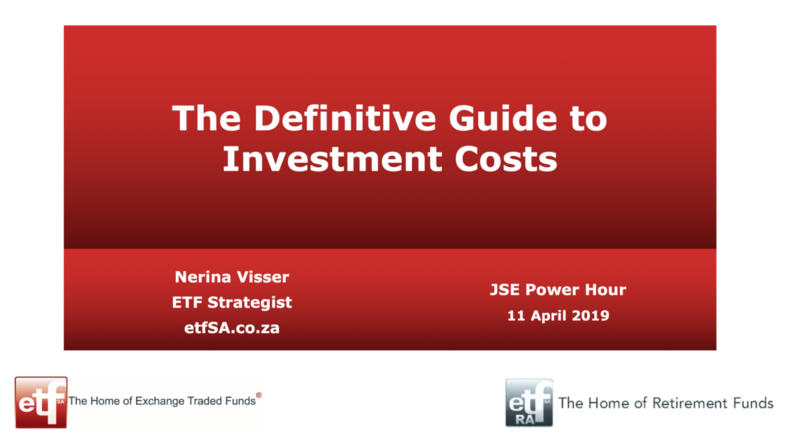 Nerina Visser of ETFsa has lunched ETFs, advised issuers and manages client ETF portfolios and presents this JSE Power Hour. She goes deep into helping us understanding all the fees, the jargon and what we can responsibly expect to pay. Expect terms such as; TER, TIC, STT, DWT, TLAs and more as Nerina unpacks them and explains what they really are and why they exist. She also explains which we can avoid, which we have to pay and which we can negotiate.